Quarterback Carson Wentz (11) has guided the Philadelphia Eagles to a 5-1 record and first place in the NFC East. 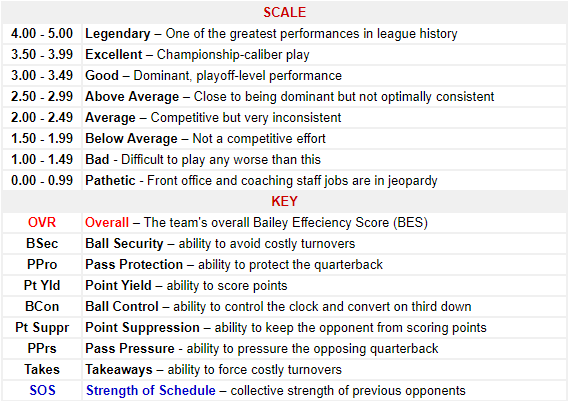 Our Week 6 BES Rankings arrive with 10 games remaining in the regular season. This is the time of year when teams, especially those who’ve tasted postseason success, start to position themselves for a surge down the stretch. This week’s report hints at several teams who could ultimately define the playoff picture for 2017. To put it mildly, the BES is trending down in its accuracy. However, we find solace in the fact that the last two weeks were riddled with upsets. 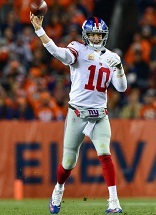 Outcomes such as the wide receiver-less New York Giants (1-5) beating the Denver Broncos (3-2) on the road headline a blizzard of head-scratching box scores in Weeks 5-6. 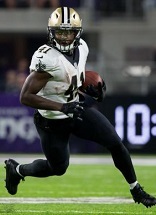 Still, some teams like the defending Super Bowl Champion New England Patriots (4-2) have managed to ride out the storm. The Patriots were stunned by the Chiefs (5-1) 42-27 in the season opener. Since then, they have languished outside of the BES Top-10 where they closed 2016 as the No. 1 team. Nonetheless, after going 4-1 in their last five contests, they find themselves perched at No. 8 in our Week 6 BES Rankings. Minus star wideout Julian Edelman and burdened by a porous defense (29th in the BES) the Patriots have found ways to win close games. But can they sustain that momentum? It will not be easy. They’re blessed with a pair of home games in Weeks 7-8 before their Week 9 bye. However, they’ll be on the road in five of their final eight games. More importantly, four of those final eight are against an embattled AFC East. AFC East , NFC South…Toughest Divisions? 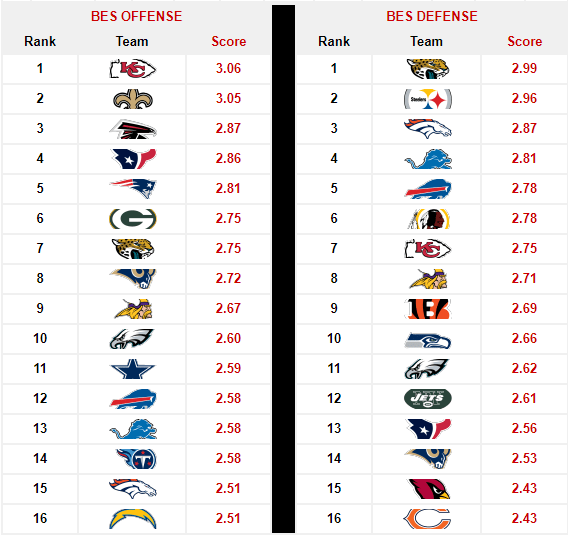 Through six weeks of action, the AFC East has registered a BES Overall score of 2.54, highest among all divisions. 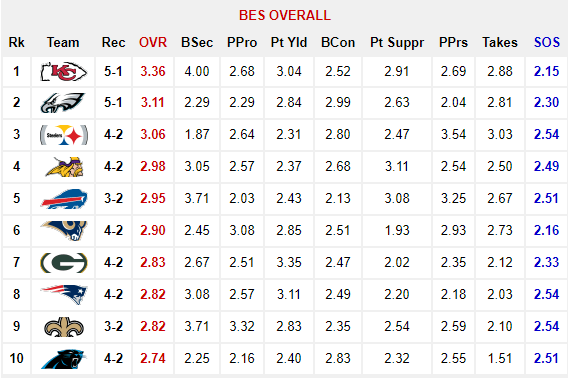 Most notably, it’s the only division with all four teams owning BES Overall scores above 2.00 and win percentages at or above .500. Could the AFC East be the league’s toughest division? Only by a narrow margin. 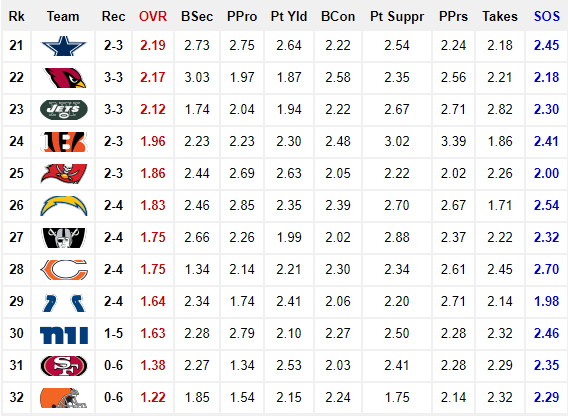 The NFC South currently boasts a BES Overall score of 2.50 as the only division with three teams ranked among our top-15. It seems fitting the NFC South and AFC East were scheduled too clash this season with the AFC East leading the series 4-3. The feud between the two continues in Week 7 when the Patriots host the Falcons (3-2) and the Buccaneers (2-3) visit the Bills (3-2). 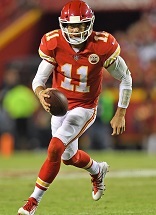 The Kansas City Chiefs (5-1), despite suffering their first loss of the season, keep the No. 1 spot in the BES for a fifth consecutive week. Still, their 19-13 defeat at the hands of the Pittsburgh Steelers siphoned .21 points off their BES Overall score. It also narrowed their lead on a field of teams with momentum that is trending upward against their downward slide. Most notable among those teams are the Philadelphia Eagles (5-1) whose lone loss to the Chiefs is all that keeps them from being the No. 1 team. Currently enjoying a four-game winning streak, the Eagles have been a fixture in the BES-top 10 since Week 3, gradually rising from No. 10 to No. 2. It remains to be seen if the Eagles will overtake the Chiefs for the top spot. Both teams have critical divisional matchups on their plates in Week 7. The Chiefs, hindered by a banged up offensive line, travel to confront the Oakland Raiders (2-4). Meanwhile, the Eagles await the Washington Redskins (3-2) who have gathered momentum of their own, jumping from No. 18 in our Week 5 report to No. 12 this week. I had a question regarding the BCon score within the BES. 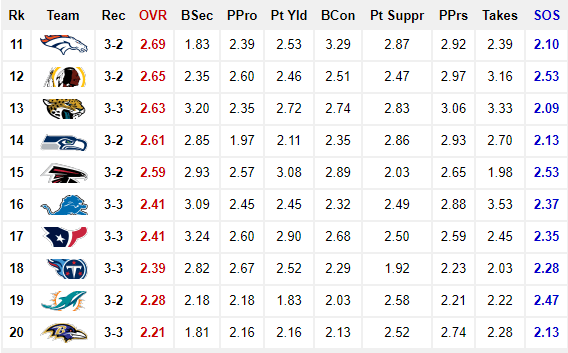 I know it relates to ToP and 3rd Down conversion rate, but Denver has held the top BCon rating throughout most of the BES weekly rankings, and their actual ToP and 3rd down completion percentage and hasn’t reflected that. Are there other things that go into determining BCon? Great question TB! BCon is a function of both offensive and defensive third down/ToP related stat categories. 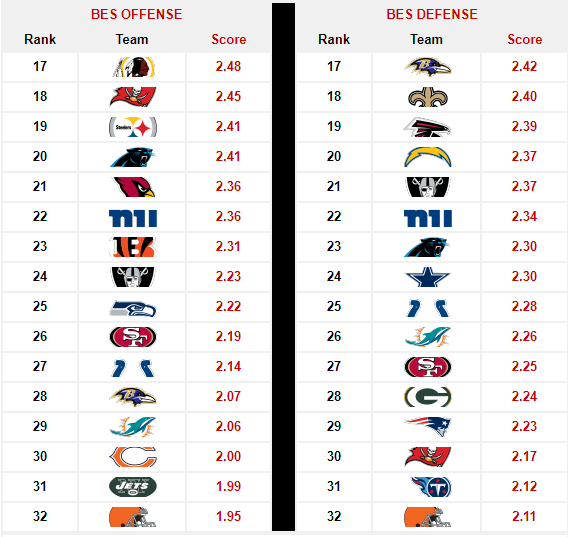 Broncos rank top-10 in those categories on both offense and defense thus their BCon score collectively reflects that. Ahh ok, that would makes sense. I was looking at offense BCon only. Thanks.